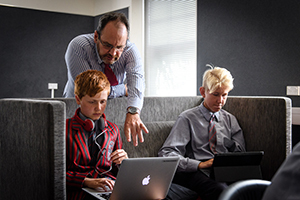 Blended Learning is used at Scots College to provide students with some of their course content online that gives them control over time, place, path and pace while supporting what they are learning in the classroom. The College uses iQualify as the digital platform for the online component of the course delivery. We have been moving through a staged delivery across all departments along with ongoing staff PD and support to ensure all teachers feel comfortable with this blended delivery. The student is offered a plethora of material types for example video, audio and visually enhanced presentations to help keep them engaged and make sure the material is easily understood. Students can be offered an abundance of supplemental resources. For example if a student is struggling they can be provided with a list of articles and sites they may find useful. If a student is excelling they can be given the opportunity to learn more through informative eLearning, videos and online lectures. Class time can be utilised to focus on educating in the physical environment by teachers answering questions, addressing concerns and making sure all students’ issues are resolved. Teachers are able to gauge how far students have progressed with a course and gain feedback from students on how they have found different kinds of testing methods. Students are empowered to take learning into their own hands, create their own schedule and enjoy the process by doing something interesting.